Part 3 of the book - Positive Peace in Schools - moves more directly into the three pillars of Peace-keeping, Peace-making and Peace-building and explores how these focuses can be useful when thinking about how schools can engage in peace work. "Peace-keeping is the first level of peace work. It covers those aspects of school life that can be considered fundamental in keeping all members of the school community safe to teach and to learn. Technically, just as in international relations, peace-keeping involves the removal of direct violence. It does not address structural or cultural violence; it keeps warring parties apart. In a school, this often translates into separating or removing students who have become physically violent; as well as ensuring that direct violence does not occur in the first place through physical prevention, rules and punishmen." "All schools are required to have a behaviour management policy. This is to ensure both consistency and transparency. Developing a behaviour management strategy, however, can be more than a statutory obligation, or a paper exercise. It can be grounded in values and dialogue, and it can provide a framework for staff and student development. We here offer a way of thinking about how schools exercise authority that fits with the notion of positive peace. It moves from away from management and towards development. The table below presents this useful distinction. 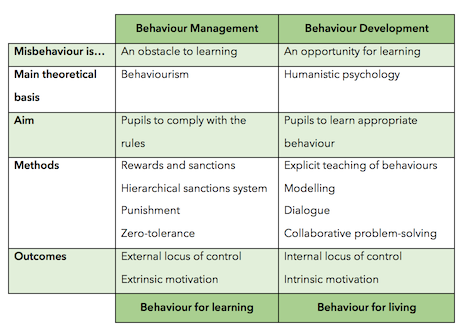 The premise is that behaviour management is a necessary, but not sufficient, focus for schools; beyond behaviour management, schools would do well to pay attention to the behaviour development of their pupils. The common phrase ‘behaviour for learning’ is here supplemented with the phrase, ‘behaviour for living’. Our contention is that engaging pupils in processes of reflection, dialogue and problem-solving about their behaviour supports them in understanding how it affects others, and making appropriate changes. This helps to develop an internal moral compass, thereby increasing the likelihood that they will become more self-regulating. We do not advocate, here or anywhere, adults abdicating responsibility for protecting the human right of every child to learn and grow in safety. We do suggest, however, that this can be done in ways that encourage development, rather than in ways that merely manage and control."